BEIJING, Dec. 20 (Xinhua) -- The world's second-largest economy is setting sail toward a new phase of development with Xi Jinping at the helm. The Chinese economy will focus on quality, a shift from the rapid growth the country has been known for over the past decades since the reform and opening up policy was introduced. At the country's most important annual meeting on economic work, senior leaders said China's economy will be characterized by more innovative manufacturing, a more secure financial system, a more open and green economy, more affordable housing and better life for the people. To achieve the goal, Xi Jinping Thought on Socialist Economy with Chinese Characteristics for a New Era will be the key, said a statement released after the Central Economic Work Conference concluded Wednesday. This year's Central Economic Work Conference came after the CPC's twice-a-decade national congress in October, which drew a blueprint for China's development over the next 30-plus years. The conference, which reviewed China's economic performance over the past five years and mapped out plans for 2018, was special also because 2018 marks the 40th anniversary of China's reform and opening up policy, which has turned the country into the world's second-largest economy. China's economy is firming, with its GDP expanding 6.9 percent year on year in the first three quarters, and 6.8 percent in the third quarter, the ninth straight quarter for China to see economic growth of at least 6.7 percent, all adding to evidence the economy is on a steady footing. The World Bank on Tuesday raised its forecast for China's economic growth in 2017 to 6.8 percent, up from the 6.7 percent it projected in October, citing stronger personal consumption and foreign trade. 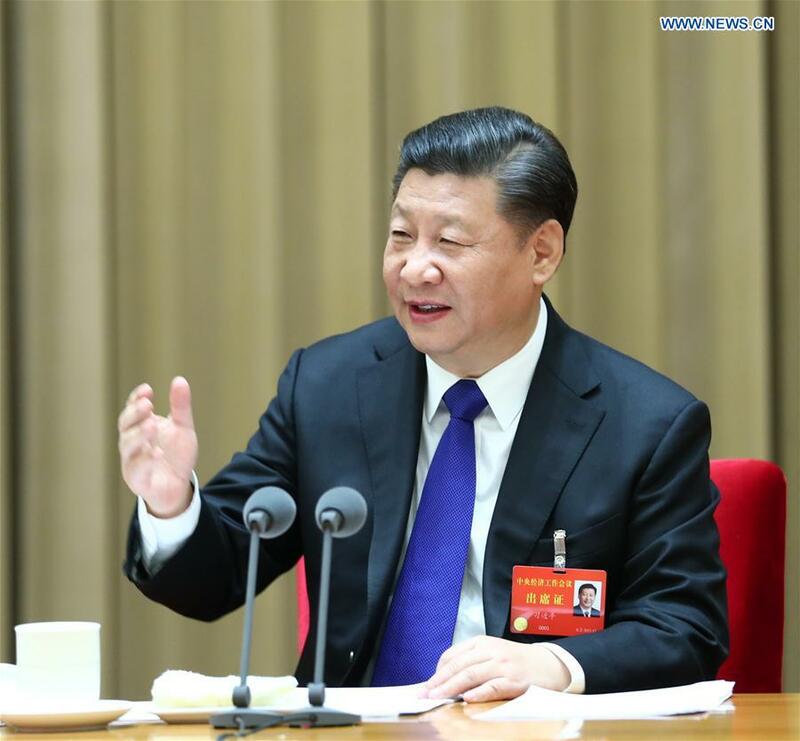 Xi Jinping Thought on Socialist Economy with Chinese Characteristics for a New Era has taken shape, said the statement. The tone-setting meeting described the thought as the "theoretical crystallization" of the past five years of practice in pushing forward China's economic development, the "latest fruit" of socialist political economy with Chinese characteristics, and the "extremely precious spiritual wealth" of the CPC and the country. The thought "must be adhered to for a long time and developed continuously," said the statement. Under the thought, people are put first in development, while efforts are made to adapt to, manage and steer the "new normal." The market plays the decisive role and the government plays its role better, and supply-side structural reform constitutes the main line of economic work. "At present and in the period to come, high-quality development is the fundamental requirement for determining the development path, making economic policies and conducting macroeconomic regulation," said the statement. China must build and improve mechanisms for pushing forward high-quality development, including necessary indicators, policies, standards, statistical and performance assessment systems. Realizing high-quality development is a must for sustaining healthy and stable economic development and adapting to changed principal contradiction of the Chinese society, it added. China will continue to deepen the supply-side structural reform as one of the major tasks for realizing such development. China will develop into a manufacturing powerhouse, with a shift from "Made in China" to "Created in China," the statement said, as the country is striving to evolve from a world factory that churns out low-end products. Measures to eliminate ineffective supply, foster new growth drivers and reduce costs in the real economy will continue. The country will improve the long-term mechanisms to ensure stable and healthy development of the real estate market. Both home purchases and rentals will be encouraged. The meeting also outlined strategies to win what central authorities have called "the three tough battles," namely preventing and defusing major risks, targeted poverty alleviation and tackling pollution. China will maintain a hardline stance on irregular and illegal activities in the financial industry to forestall risks. China's rapidly expanding financial industry is being placed under greater regulatory scrutiny as authorities step up efforts to curb widespread malfeasance in the sector to guard against risks. To ensure stable economic growth while averting financial risks accumulated over years of credit binge, China has decided to maintain a prudent and neutral monetary policy in 2018. "Prudent monetary policy should be kept neutral, the floodgates of monetary supply should be controlled, and credit and social financing should see reasonable growth," said the statement. For the battle against poverty, policymakers pledged to work to ensure the quality of poverty reduction efforts under current standards, and focus on helping special groups and eradicating abject poverty. Pollution control will also be a key battlefield, with authorities aiming for a significant reduction in major pollutant emissions and improvement in the overall environment. Efforts should be focused on adjusting the structures of industries, eliminating outdated capacity and making the skies blue again, according to the meeting. As the major driver and stabilizer of the global economy, China will push forward a new pattern of all-around opening up to pursue mutual benefits with the rest of the world, according to the statement. Chinese leaders have reiterated that the country will not close its door to the world, and that the door will only become more and more open.